Genealogy is one of my favorite hobbies. I find it especially gratifying to get acquainted with ancestors that I otherwise never could have known. For instance, I never met my great-grandfather, Rev. Frank J. Scribner (he died four years before I was born), but I am quite certain that I would have greatly enjoyed him. Not only did he share my ministerial calling, but by all accounts he was a generous, intelligent, and loving man. He had a quick wit and was a maestro in the art of turning a phrase. I don't know that my dad ever came out and said it, but I'm pretty sure that he was the man my dad most admired. One of the primary means through which I have gotten to know him is through the reading of his journals, his sermons, his book, and his various personal correspondences. 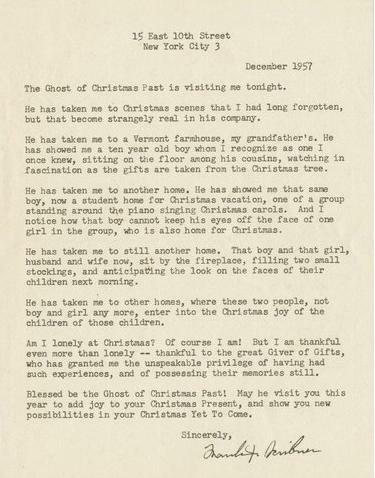 Among these are this Christmas letter which he penned 60 years ago. Reading it has become part of of my holiday tradition, just like singing carols, decorating the tree, or setting up the Nativity scene. Despite tradition and most portrayals of the Nativity, in reality there is no more than a 1/12 chance that the visit of the Magi came in December. Every December though, I experience the gift of being visited by this wise man. I hope you will enjoy reading his Christmas letter and be blessed by it as well.